Throughout most of Europe it is almost impossible to walk into a junkyard with tools and pull your own parts. Laws passed over 20-years ago have effectively banned pull-a-part yards for questionable safety reasons, but smaller yards generally located in rural areas will sometimes overlook the rules and let customers wander around. We photographed this BMW 5-Series (E28) in a German junkyard that was nice enough to let us in and walk around the 40 or so cars it had in stock. One of the oldest vehicles on the lot, the 5 is covered with moss that indicates it spent several years sitting outside in a damp spot before being towed to the junkyard. The car is almost completely stripped inside and out but an ignition coil visible in the engine bay reveals we’re looking at a gasoline-burning model. Power was sent to the rear wheels via a manual transmission, although whether the car packed a straight-six or a four-banger is up in the air because it was delivered new without an emblem on the trunk lid. 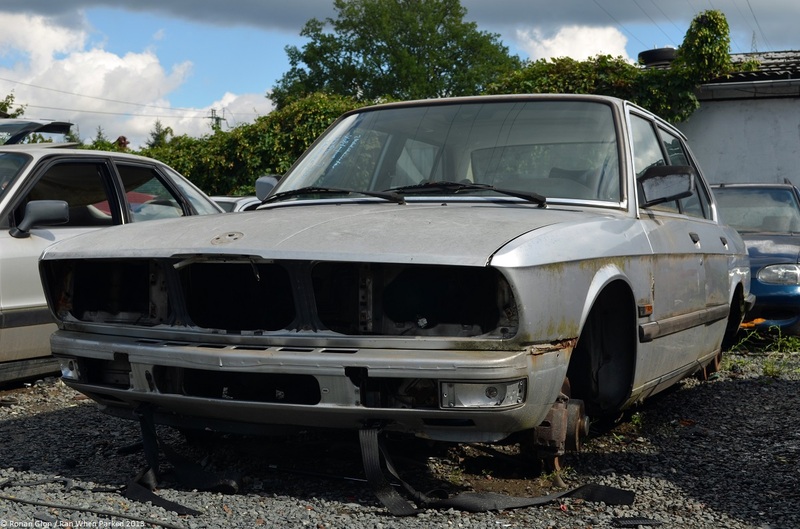 The 5 probably would have had a difficult time passing Germany’s stringent inspections system as its body is fairly rusty so we’re happy to see its parts have presumably gone on to keep other E28s on the road.